Home / Light & Electricity / What are Convex and Concave lenses? What are Convex and Concave lenses? Lenses are used in cameras, telescopes, and other instruments to refract and to focus rays of light. Lenses used as eyeglasses help people with poor eyesight to see better. Most lenses are converging lenses. This means that light rays passing through them are refracted and come closer together, or converge. The lenses in some cameras, in some eyeglasses, and in your eyes are converging ones. The simplest sort of converging lens is thicker in the middle than at the edges. Both surfaces of the lens curve down toward the edges. Lenses like this are called convex. Converging lenses are used to make things look bigger, or magnified. 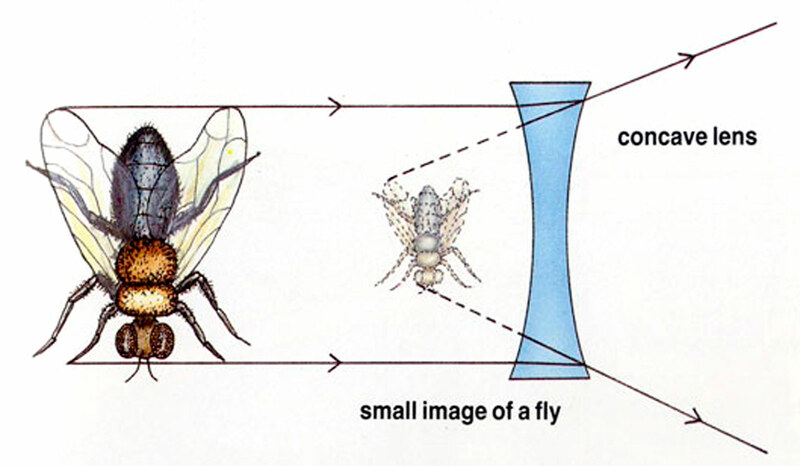 Look at an object, such as a fly. through a convex lens. The fly will be magnified and appear bigger than it really is. Concave lenses are thicker at the edges than in the middle. Their surfaces curve up toward the edges. They make light rays spread out, or diverge. These lenses are often called diverging lenses. Objects seen through a diverging lens look smaller. Astronomers use large telescopes with both convex and concave lenses. Look at a fly through a concave lens and it will appear smaller than it really is.